My first six years of schooling were spent at a classical school, which meant that between the standard math, science, and English lessons, classical music and art played a large part in my early education. I remember looking at scanned copies of Rembrandt and van Gogh and Michelangelo and being mildly interested in them - as interested as an eight-year-old can be when faced with fine art, knowing that it's the only thing standing in between you and recess. Monet had his own special moment in our class, in part because NCMA has several of his works in their permanent collection and we were able to visit them anytime we wanted. But the real magic of Monet didn't reach me until 6th grade, when a large group of school friends and I visited the Monet traveling exhibit at the NCMA, where 60+ of his works took over the downstairs exhibit space for several months. As the docent walked us around the pieces, adjusting her talking points to the interest level of middle schoolers, I fell in love with Impressionism. I realised how I loved seeing the brushstrokes, standing so close it looks like a haphazard mess of paint before stepping back to see the work as a complete picture. It was the first time I'd seen a famous painting in real life that I'd only previously seen in pictures, and it gave me goosebumps. 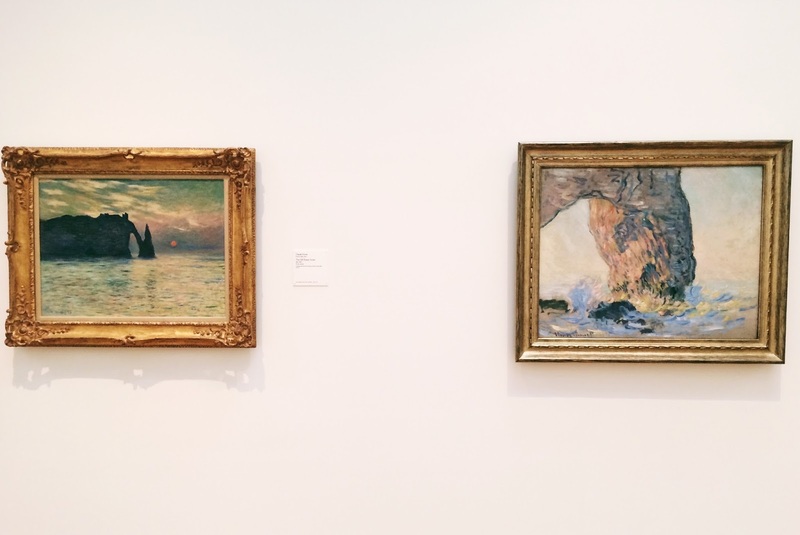 Since that moment, I've been fortunate enough to travel to Europe and other U.S. states and see Monet's works hanging in other museums - some new to my eyes, but most that I've seen before. Monet's works have become like a homing signal for me, far more than seeing a McDonald's or a Starbucks on a foreign city's corner. Seeing art in real life has become exciting and I can trace the feeling back to single moment in time. Many of my friends who are art majors/minors tend to downplay Monet or list off other Impressionist artists who were better at their craft, but for me, loving Monet has never been about the technical skill or the accuracy of portrayal, but the emotional pull of standing in front of something again, like so many thousands of others before, and finding a personal connection with a previous version of yourself.